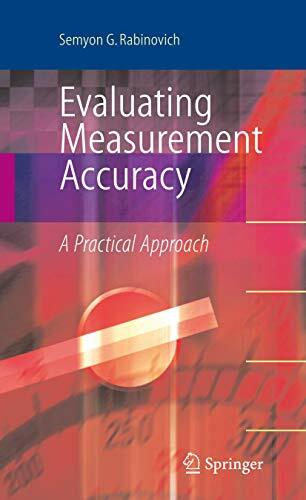 "Evaluating Measurement Accuracy" is intended for anyone who is concerned with measurements in any field of science or technology. It reflects the latest developments in metrology and offers new results, but is designed to be accessible to readers at different levels: meteorologists, engineers and experimental scientists who use measurements as tools in their professions, graduate and undergraduate students in the natural sciences and engineering, and technicians performing complex measurements in industry, quality control, and trade. The material of the book is presented from the practical perspective and offers solutions and recommendations for problems that arise in conducting real-life measurements. This inclusion is a notable and unique aspect of this title as complex measurements done in industry and trade are often neglected in metrological literature, leaving the practitioners of these measurements to devise their own ad-hoc techniques.